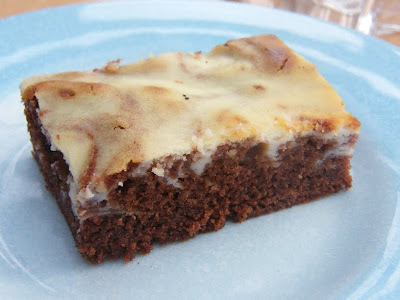 I was very excited when I saw these brownies on Katie's blog - Katiecakes. They more than lived up to my expectations. The sweet, milky cheescake topping is a lovely contrast to the rich chocolate flavour of the brownie base. Oh, I must go have another slice just now, I will just have to carefully and slowly move the baby off my lap, so I don't wake him. Wish me luck! Aren't husbands lovely? One slice of yummy brownie, a glass of raspberry milkshake and a still-sleeping-soundly, cute little baby on my lap. Life is sweet! OK, back to business. I converted the recipe into cup sizes, but you can see the original metric recipe over at Katiecakes. If you do head over there, you will notice that Katie's brownies are not as deep as mine. There is a good reason for that. I didn't have enough plain flour left, so after a bit of research I found out that some brownie recipes call for self-raising flour. I decided to go for it and see what happened and they turned out great! Perhaps more sticky cake-like rather than intensely fudgey. So if you like a cakey brownie, use self-raising flour and if you like your brownies more fudgey, then use plain flour. Preheat oven to 180C/350f/gas mark 4 and grease a 30cm x 18cm brownie pan. In a medium saucepan melt the butter over a low heat. Once melted stir in the cocoa powder and sugar, combining till smooth. Add the egg, beating the mixture till fully incorporated before adding the flour. Stir through until smooth and add to the prepared pan. Put the pan in the preheated oven and bake for 35 minutes. Testing regularly with a cake skewer. Thanks for the recipe Katie, I will be enjoying this one again and next time, I will try making it with plain flour, so I can decide which style I prefer. Hopefully my marbling will improve next time. Wow! I am more of a savory girl than a sweet one, but I want these, right now. Just perfect Jackie and such a sweet photo of little Cooper. Argh! I'm so glad you liked these brownies! They're delicious aren't they?! This looks like a fantastic idea - what's not to love!!! Oh dear, what are you doing to us showing us these delicious looking brownies! It makes me want to run out and buy the ingredients to make my own brownies lol. Your little boy looks ever so sweet! 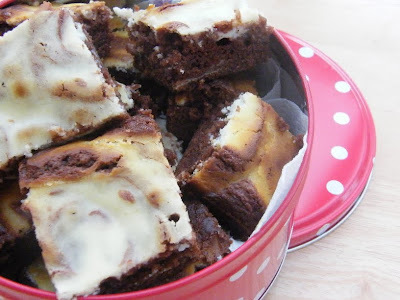 MMMMMMM,...these cheesecake brownies look indeed very tasty!! I think the marbeling works just fine. I prefer cakey so I will probably go with your recipe. Fudgey is good. Really good! What an adorable, peacefully sleeping baby! Awwww, Cooper is SO adorable!! Such a wonderful photo!! I love the dark and white look and I'm sure they tasted wonderful. Although I do like my brownies fudgie. Yeah, they are brilliant Katie, I just love the cheesecake topping. What a difference it makes to the flavour of the brownies. Very, very tasty Sophie! We don't even want to share these. 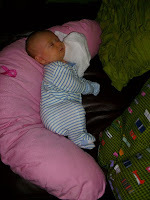 There is nothing sweeter than a sleeping baby...what a cutie. The brownies look decadent and delicious. Your still on that chocolate roller coaster! You did an amazing job with Katie's brownies! I am a brownie fanatic and these are so decadently naughty! Oh my oh my! Must make these RIGHT NOW! Ooo those look perfect! I've made cheesecake brownies before but they didn't look that good. Yummy...I would bake some myself if I hadn't eaten far too much cheese over the past two weeks!